Did you know that only 10% of the world's population is skilful with their left hands? I just learned about this yesterday, thinking how unique (and special!) my younger sister is (a lefty). A lot of things in this world are designed for right-handed people, making everyday things trickier for the left-handed: from writing, driving, to even locking the gate! Tables were turned yesterday as Pilipinas Shell challenged me and my friends to several tasks... using our left hands! We met in a studio in Makati, had our hair and makeup done, before going in front of the camera for the crazy tasks! First Assignment: Add two scoops of ice cream into a cone using our left hand. It was easy naman, but siguro kasi tunaw na sya! Haha! Second Assignment: Write using our left hand. I was able to do it, but not as nice as my right-hand penmaship. Hehe! Parang pang Grade 1! And lastly, we copied and colored several shapes using a computer mouse. Ang tagal namin dito, haha! Me: "O diba, buti nalang hindi ako perfectionist!" 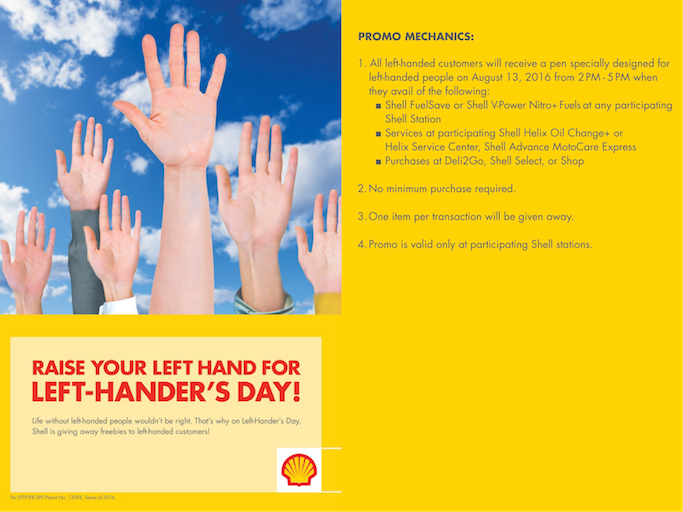 On International Left-hander’s Day (August 13), Pilipinas Shell is giving away a unique gift to left-handed motorists that they could use every day. “We at Shell are one with left-handers in celebrating their uniqueness and individuality on International Left-hander’s Day,” says Anthony Lawrence Yam, Pilipinas Shell Vice President for Retail. Pilipinas Shell continues its commitment to make every visit to a Shell service station a delightful experience for all customers. Shell celebrates with motorists every special day such as the International Left-hander’s Day, and more surprises are in store for Shell patrons in the coming months that will surely delight them in more ways than one. To our lefties family and friends, you guys are awesome!